U.S. 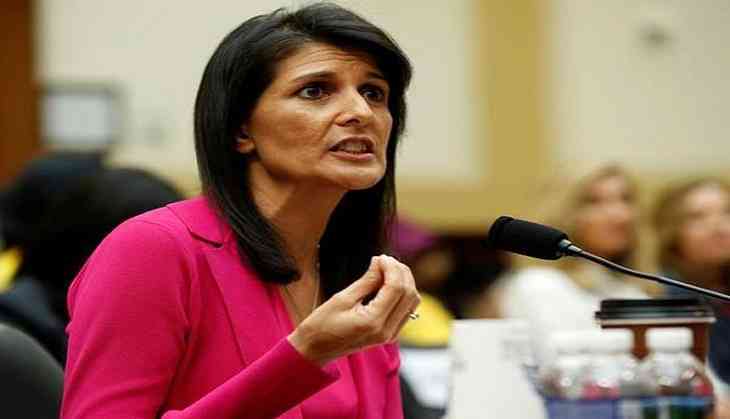 Ambassador to the United Nations Nikki Haley has slammed the Security Council for failing to take action against Tehran over its alleged lack of compliance with the 2015 nuclear deal and compared Iran to a "scorpion" which can't help stinging. The criticism of Haley comes despite the United Nations and the European Union praising Iran for honoring the landmark nuclear deal with six major powers, but U.S. Ambassador Nikki Haley accused Tehran of "destructive and destabilizing" actions from ballistic missile launches to arms smuggling. In an unusual diplomatic language Haley said "Reminds me of the fable of the scorpion and the frog.Iran support for terrorist groups continues unabated"
She listed the recent test-firing of ballistic missiles by Teheran, its alleged purchase of missile-related technology, weapons smuggling, and its general "destructive and destabilizing role in the Middle East," as well as "support for terrorist groups." "The Security Council has failed to take even minimal steps to respond to these violations," Nikki Haley told a council meeting called to discuss Iran. "These measures are here for a reason. This council should be here to enforce them," she said. The Security Council adopted resolution 2231 two years ago to endorse the nuclear deal between Iran and six world powers, lifting economic sanctions in exchange for curbs to Tehran's nuclear program. "Today's meeting of the Security Council on the implementation of resolution 2231 is taking place against a backdrop of steady implementation, cooperation and progress," Jeffrey Feltman, Under-Secretary-General for Political Affairs, said on Thursday at a Security Council meeting on implementation of a UN resolution endorsing the July 2015 nuclear agreement.